On the tiny island state of Bahrain an intelligent, highly politicised Shia majority is ruled by an actively sectarian Sunni ‘king’ and his mercenary police force. To ensure minimum fraternisation, and to shrink the Shia majority, Sunni Arabs from such countries as Syria, Jordan and Yemen are awarded citizenship after loyal service in the police. Bahrain was known to Sumerians as Dilmun, a possible location for the Garden of Eden. Today it’s known to Americans as the home of the Fifth Fleet, one of the more essential bases for guarding the Gulf. It’s linked by causeway to Saudi Arabia, which provides it with security and thousands of drunk young men on Thursday nights. It is likely that Saudi Arabia would intervene if Bahrain went the way of Egypt. Police killed a protestor yesterday. At his funeral this morning they killed another man. And there are reports of a child also shot dead. There’s information on state repression at the Bahrain Centre for Human Rights. Photos of the Day of Anger here. Media coverage is not great (Jazeera’s home base Qatar is swimming distance from Bahrain – we’ll see if this means anything), so follow on the facebook page, and in Arabic. shame on them who are oppressing the brave people of al haq. bahrain will follow lebanon ,iraq,syria under the righteous guidance of al wilayah . Abu Turab – it’s notable that the protesters in Bahrain have not used sectarian language. I think this is the best policy. 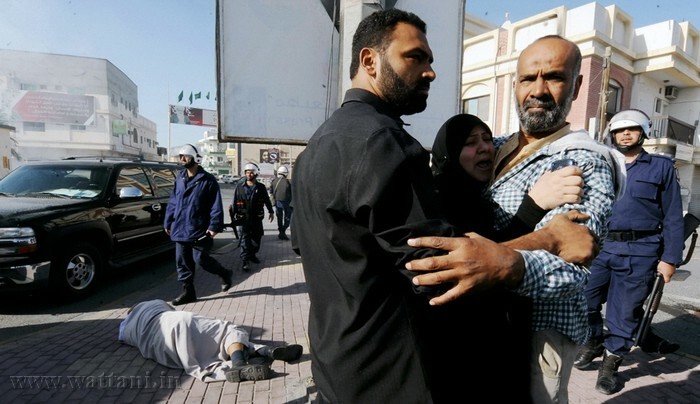 What’s happening in Egypt, Tunisia and Libya has nothing to do with the Shia – it’s about universal liberation.